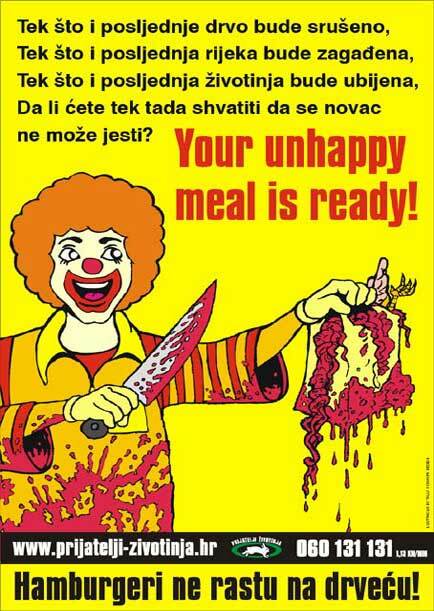 To Animal Friends one of the most important dates is the World anti-McDonald's Days. So on Wednesday, October 16, Animal Friends will organize a public action against the multinational campaign accused for huge ecological damages, using children as workers, manipulation with children, crimes on animals, serving unhealthy food, and for hunger in the world. The action will be kept on October 16 at 5 P.M. in front of McDonald's in Jurisiceva ulica in Zagreb. With the campaign on the same day will be put a billboard in Savska cesta against cruelty on animals, ecological damages, and fast food. McDonald's also doesn't use recycled paper, nor does it recycle. In Croatia in the last six years not even one example of trash was recycled, because it ended on mixed trash. There are a lot of doubts that the toys which one can get in the "happy meal" have been made by children in other countries. When we raised that issue, we didn't get any answer from McDonald's. We actually didn't get a lot of answers, so to answer any question they organized something called the "open doors." Again we had a lot of questions, and again we got no answers. The fridge we didn't want to see because the sanitary standards have to be satisfied, what we had no reason to doubt. Besides, there are inspections which take care about that, like this is the case in other restaurants as well. What we wanted to point out is that McDonald's is using people and children, destroying rainforests, that their system of throwing trash is far from being satisfactory, their way of treating employees and rights to join the syndicate. We are not interested in their kitchen or their fridge, but the business itself. However, the company has a clear goal. To advertise, and not to answers the questions. This is the second time that McDonald's has organized some kind of "benefactor" in the time of the World anti-McDonald's Day. They used children as one of their actions (four years ago), which would by some miracle, be kept after October 16. But as we all know this isn't the first time they've used children for their purposes. The manipulation with children is one of the biggest problems with the company. Commercials meant for children draw them to the restaurants in that "magical circle," which is actually passed from parents on their children, then on the children's children, and, in doing so, creating the exact "magical circle." The biggest bate are cartoons, toys, clowns, balloons, and everything which can be used as an attraction. Parents are only the financial support. Very often there are organized "trips" to McDonald's restaurants. Who gives the right to McDonald's to organize school trips? Why is McDonald's the ultimate choice? McDonald's isn't a museum, or a theatre, or a park, and it sure isn't anything educational. It's only a restaurant with unhealthy food about which a lot of people have complaints. This action raises new questions. We want answers, and we won't stop until everyone finds out the truth.